Frightened Rabbit are set to release the “State Hospital” on September 24/25th, but in the meantime you can stream the 5 song EP below. Holding us off until the future full length album, which will have a complete set of brand new songs. 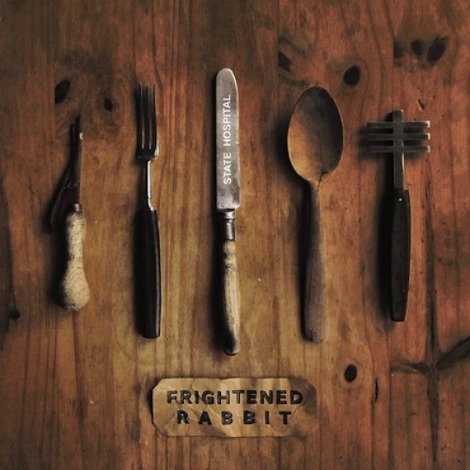 “State Hospital” by Frightened Rabbit, off the upcoming EP by the same name. The fruits of our labour are nearing your ears. That is to say, we’re releasing our tidy wee EP ‘State Hospital‘ very soon and wanted to let you know a few things about it. It contains five songs. The title track is the first snippet from our next album, but the rest of the tracks are unique to this release, even though they were all contenders for the full-length at one point or another. I suppose certain songs just don’t fit in to an album, but we thought these four still deserved to be given more than simply ‘B-side’ status. Because we had been writing and demo-ing for this record for some time, we found ourselves sitting on a lot of songs at the beginning of the year. Too many really, if there is such a thing. You’ll be glad to hear that we didn’t even toy with the idea of a double album, probably because we weren’t taking any drugs. So this seemed like the best way to show off the extras and give you a taste of things to come.